I hope every one had a great and colorful Holi. Holi is a festival colors celebrated during spring. Just the thought of Holi brings back so many fond childhood memories. Playing with friends, getting drenched in colored water, getting hit by water balloons.. super fun. After we were done with the colors, we would clean up and a special delicious Holi lunch would be served for the entire building (where I stayed). Seriously, HOLI and DIWALI are the two festivals I miss the most staying in USA. Especially Holi because we usually have very low temperatures during that part of the month and hence are stuck at home:(. But this year I am happy as the local temple has decided to have a special Holi event in May so that everyone can play with colors in some good weather. Now coming back to food, traditionally, Thandai is the most popular drink to be prepared and served during this festival. This year, I decided to make something different. I made Badam Pista Carrot Milk. This drink is easy to prepare and can be prepared in a jiffy. Apart from the easy preparation , I have to mention that this drink is very healthy. It has the goodness of carrots, nuts and of course the milk. This drink can be made VEGAN by switching the regular milk with ALMOND MILK or CASHEW MILK. 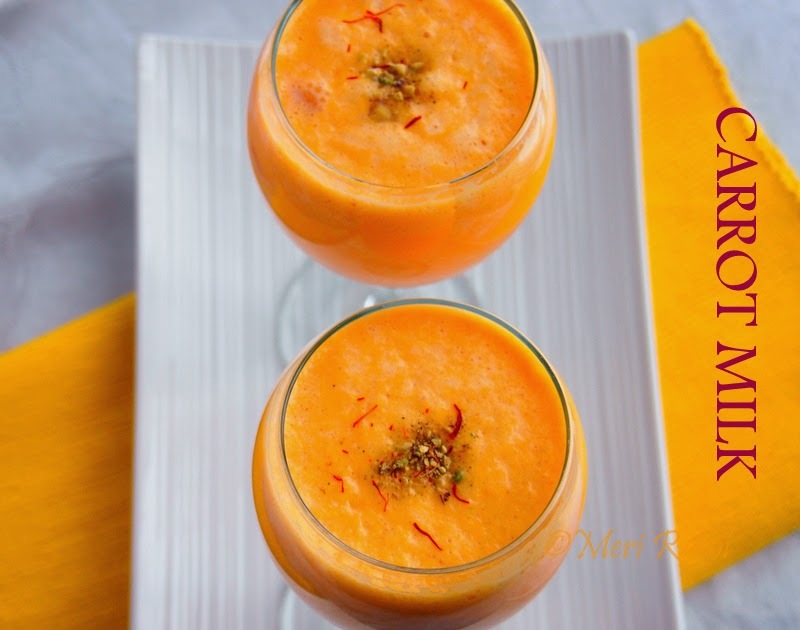 So here is how you can make this easy, delicious and healthy drink. While the carrots are cooking, soak almonds and pistachios separately in warm water for about 15 minutes. Remove the skin from the almonds. Once the cooked carrots have cooled down, grind the almonds, pistachios, soaked saffron, milk and sugar. Lastly , add the cardamom powder. 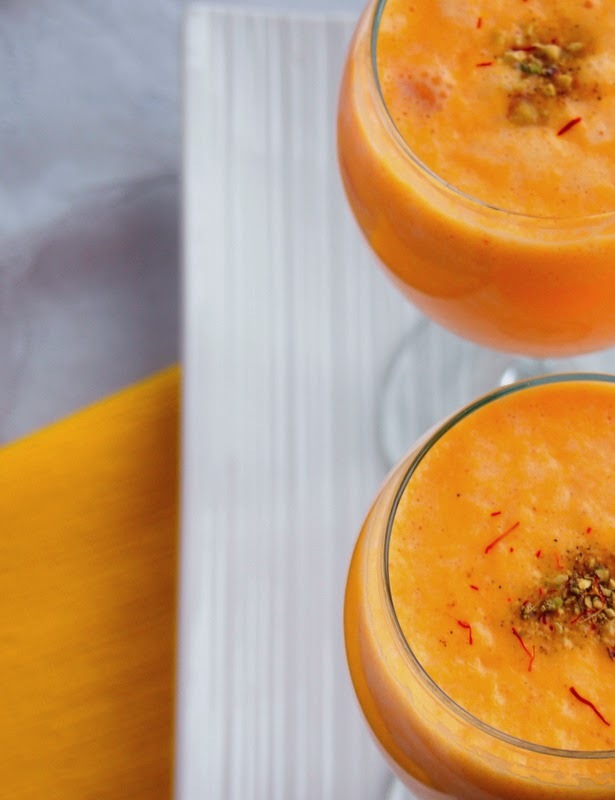 Serve chilled, garnished with finely chopped nuts(almonds and pistachios) and strands of saffron. This post is a part of the BLOG HOP event "HOLI SPECIALS". Also check out many more delicious dishes from the other members of the blog hop group Piyali, Anu, Vani , Padma and Jayashree. Ohhh! Another attractive stunning dessert or shall I say drink? Whichever it may be. Certainly captivated my attention. 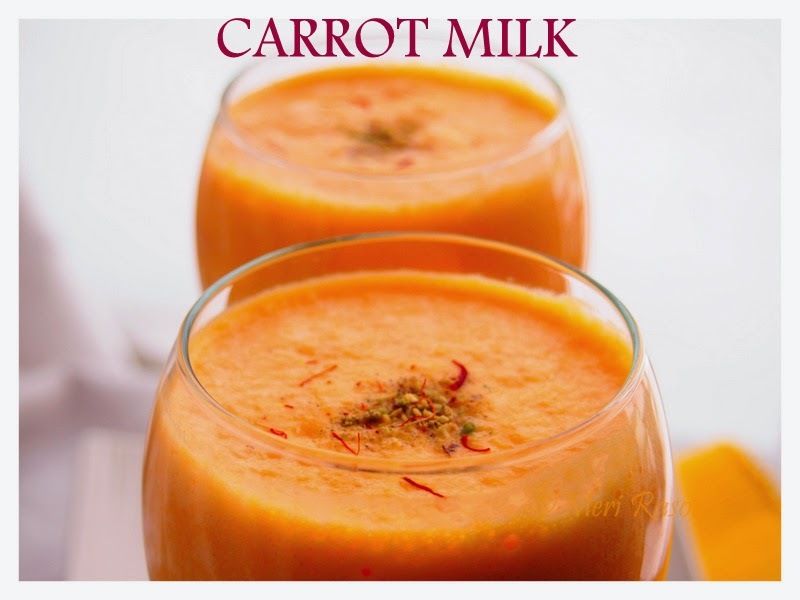 Whenever I crave for dessert during the week days, i make this and i can enjoy a good drink without much guilt too..
super delicious ......badam pista carrot milk...Drolling here..
Badam pista carrot milk is new to me. sounds interesting and wow, what lovely color the drink has. great clicks too dear..
Now no-one can say no to milk!! Loved your recipe and presentation dear! Wow factor!.. who doesn't like to drink carrot juice after seeing this :) i have also tried to show my creativity while presenting Kajjikayalu recipe.